This was an African Adventure of a lifetime, we did and saw so much over an 18 day period and covering some 6000 kilometers. 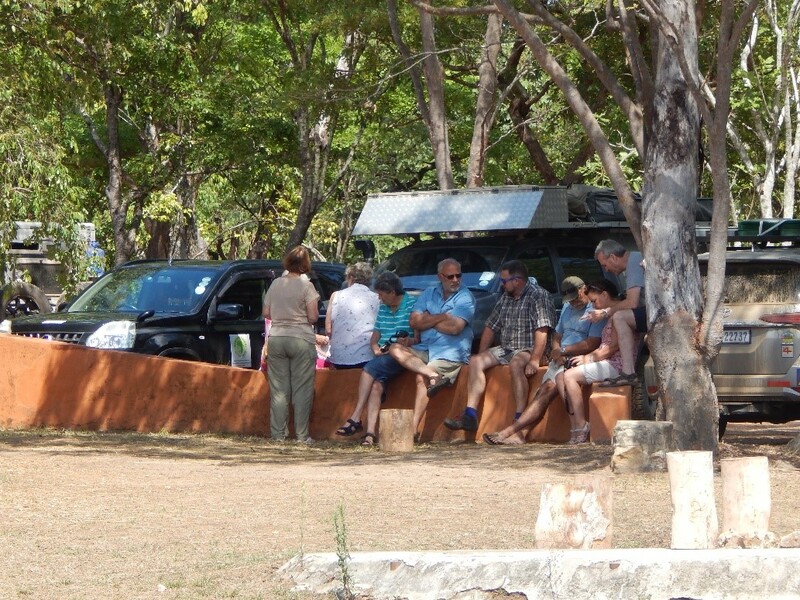 Our first official night together had 12 of us and 6 vehicles spending the night the Kubu Lodge camping site, it’s a large campsite with a clean ablution block and a swimming pool. The resort has a number of Bush Buck freely roaming the facility and often paying the camp site a visit and all this no more than 50 meters from the Chobe river. Here we had our first of many briefings and a rundown on what to expect in the days ahead and until we would meet again at the same site on the way home, that would be in 13 days from now and a few thousand kilometers later. We entered Namibia by crossing the Chobe River over the Ngoma Bridge not far from Kasane in northern Botswana. From there it was a scenic drive along the Caprivi Strip (now renamed to Zambezi) to Katima Mulilo and into Zambia. Getting into Zambia, although well-organized border formalities, it will set you back in the region of R1500, some payable in $US and the remainder in Kwacha. You cannot get Kwacha in SA and are therefore forced to use either their touts or the Bureau, having learned from previous experience, we used the ATM, no costly tout fees to contend with. Our first night stop over was a short dash of 80 kms on the M10 from Katima to a neat and rustic resort nestled in the bush on the banks of the mighty Zambezi River. Kabula Lodge was a welcome sight with lush green lawns under large shady trees and a view deck and bar overlooking the Zambezi. After meeting up with our last party member who was travelling alone, we were now a full team of 13 adults and 7 vehicles, with 4 of us towing trailers or off road caravans of sorts. Departure time was set for 07h00 the following morning, we had a long way to go and we would be camping in central Liuwa Plains that night, a trip of around 375kms straight up the M10 to Mongu and then the last village of Kalobo before crossing the ferry over the Luanginga River into Liuwa Plains. The M10 follows the Zambezi River most of the way with the spectacular Barotse Flood plains always in sight. The Barotse flood plains are flooded each year when the Zambezi bursts its banks during the wet summer rainfall season. Crossing the ferry at Kalobo it a true African experience, vehicles are transported one at a time over the 100 meter wide river and everything is done by hand, no machinery in these parts, it took a while for us all to cross but were on our way again just after lunch time. The exit from the ferry is up a reasonably steep sandy river bed and with trailers in tow proved to be quite challenging for a few of us. We were here for the Wildebeest migration, it happens each year during the month of November. Strictly speaking, the animals are not in an actual migration, but rather have arrived at the end of their migration from Angola. 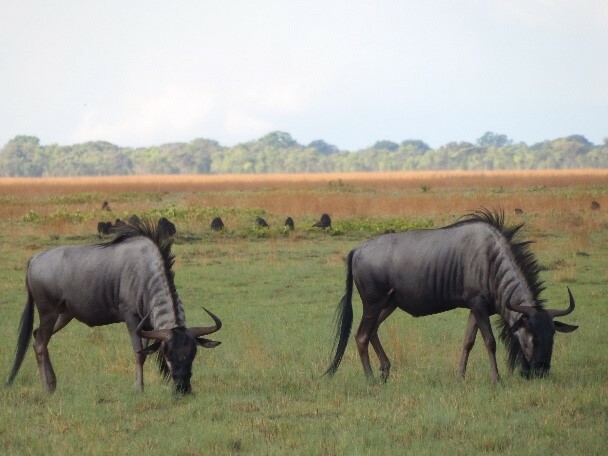 Liuwa Plains, which is the grazing grounds for the herds is a vast and wild plains covering an enormous area. Because the plains are dotted with numerous small pans or what we would normally call water holes and are usually frequented by a vast number of birds of all sorts. A birders paradise. It was interesting to see how the Wildebeest split up their herd. The main herd because of its sheer size in numbers gets spread out over a large area, and then you get the nursery herds that are fairly small herds and made up of the females with their calves, some herds being mixed with small numbers of Zebra. My guess would be, that before migrating back to Angola, the smaller herds would once again join the main herd for the long march home. We undertook a few interesting game drives and at one stage got close to where there had been reports of a lion kill but never actually found the scene. What makes this really interesting though is that it means that there are still lion to be found in the area after Lady Liuwa, the last known remaining lioness, died a few years back. The campsite we stayed in for the first two nights was Katoyona, a community site and there were always a few community members close by to keep the showers hot and the water tanks full. They also supplied the firewood as we required. For the last night we shifted on to Kwale camp, a little closer to the ferry in preparation for an early exit the following morning. 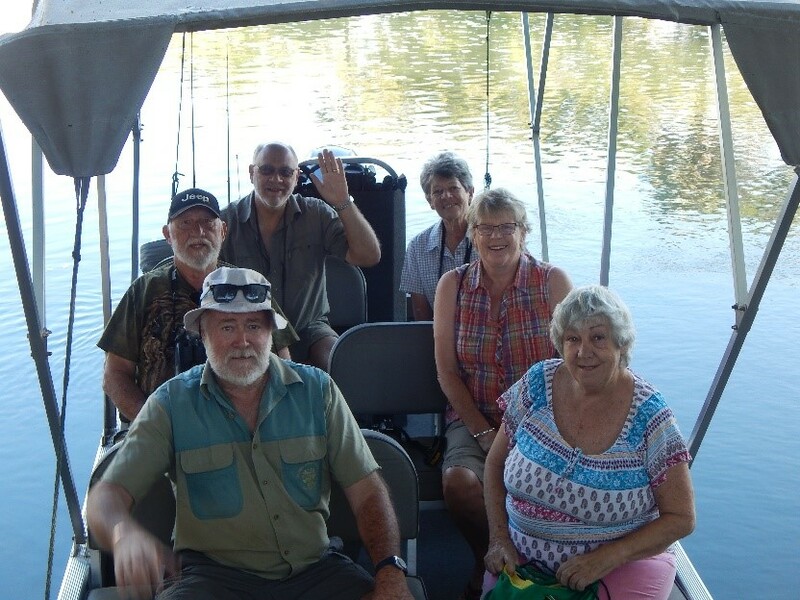 After spending three nights in Liuwa, it was an early departure for the return crossing on the ferry before driving a long haul of around 440 kms to Kasabushi camp in Kafue National Park. 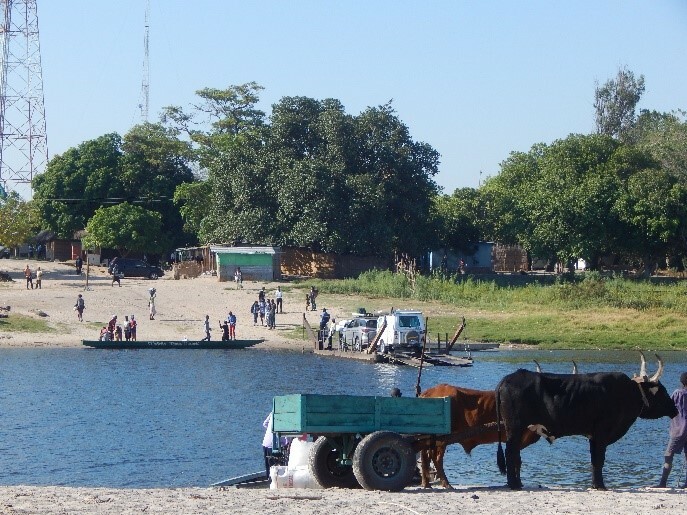 We arrived with daylight hours to spare after setting up camp on the banks of the Kafue River. What the owners, Andy and Libby have done with their piece of paradise in the middle of nowhere is nothing short of amazing. A fantastic and innovative open air ablution facility with large bi-sexual showers with plenty of camping space. The toilet and wash basins are all covered and well set out, what a pleasure after the very rustic community conditions at Liuwa. Andy took us on a very interesting and informative boat ride down the Kafue River, thankfully giving the Hippo’s a pleasantly wide berth followed by some expert navigation through the numerous rocks and boulders, and the river was lower than normal which had Andy putting all his river skills into practice to keep us afloat and in one piece. Kasabushi was to be our home for the next three nights, where there’s lots to see and good game drives to be undertaken. The few who took Andy up on his offer of a night drive were rewarded by arriving at the scene of a very recent lion kill which included cubs. 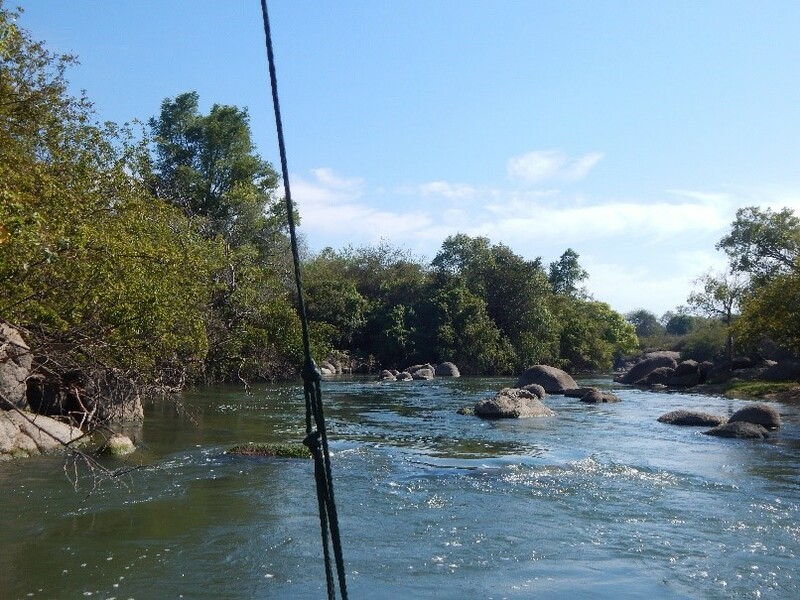 The Kafue is wild, untamed and largely un-spoilt. The game viewing was pretty good with excellent sightings of lions and their cubs, Roan Antelope, Water Buck, and a big herd of Buffalo. An unfortunate side to the Kafue, as well as other parts of Zambia is the Tsetse Fly population. There were lots of them and it was not always possible to drive with the windows open, which also makes it difficult for good photography and the lack of fresh air. The day we left Kasabushi we had a another long drive, all the way to the Forest inn, some 530kms in distance and an estimated 8 hours of travel time. We arrived at the camp site with daylight hours to spare and a short time to look around. Not much to see but it is an excellent transit camp for where we were headed, Kasanka National Park. 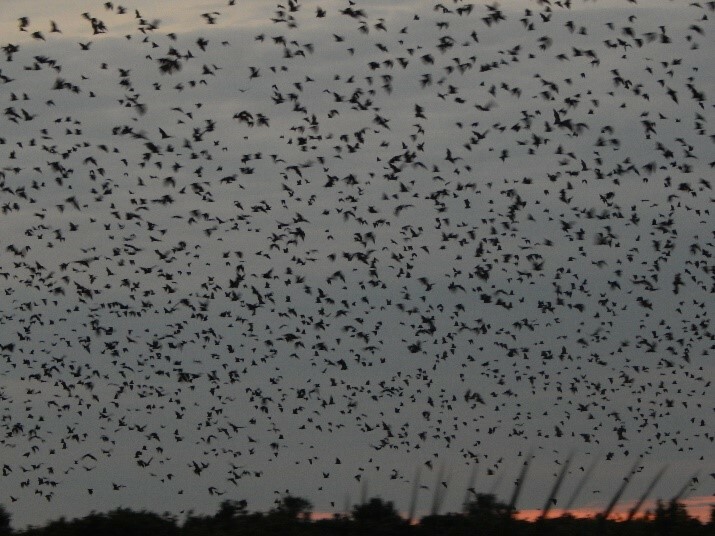 During the months of November and December each year, Kasanka is home to an estimated 10 million straw / fruit bats. They Migrate from somewhere in the Congo to come and feed off of the Wild fruits to be found in Kasanka. They feed off of the wild plums and Loquats in nearby forests. Witnessing these bats leaving their roost each evening and then returning in the early hours after their night out is really one of nature’s great marvels. The bats, having a wing span of up to 800mm do not rely on sonar navigation but do in fact have vision, necessary for finding their fruit each night. It takes in the region of an hour and a half for the bats to leave each evening and probably the same in the morning upon their return to roost and there is very little noise other than perhaps a bit of wind noise caused by their flapping wings. We had paid for a guide and hired a “Hide” for the second morning that we were there. After meeting at 04h30 we followed our guide, on foot, through the forest to our hide to witness the bats from close range and upon their return from their night out. The hide is not a hide like we know, sitting on a cushion watching through a slit at the animals on the other side. 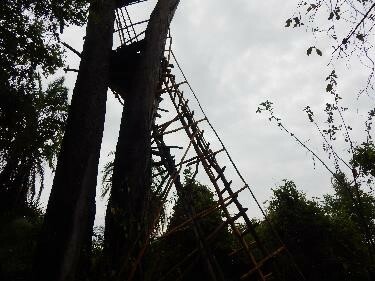 No this is a platform way up in a tall forest tree that you get to the top of by climbing a rather primitive ladder. The top platform is around 20 meters up and the first one around 10 meters, climbing this in the dark with wet shoes requires a certain amount of caution. Once up, it’s really very rewarding, from the top platform, you are now looking straight at the bats as they fly past and looking down at them when they come in to roost. It’s an awesome experience and one that is permanently embedded itself in my memory bank. Climbing the platform in the dark when one cannot see just how high they are going is one thing, climbing down again in the daylight when you can see just how far you are from Terra Firma is another thing and is not everyone’s cup of tea. The road home took us to Eureka camp on the southern outskirts of Lusaka, for the night and then on to Livingstone the following day as we made for the ferry crossing at Kazungula and then to Kasane for the night. It was a tight squeeze but we did manage a really quick trip t a look out point of the falls for those who had not seen them before. The falls are a big tourist attraction and as such the cost of getting to view the falls from the view site comes at a high price. The ferry crossing at Kasangula was fairly straight forward and one of those times where it helps to pay a tout and then let them run from office to office getting all the necessary stamps and permits required for another typically African border crossing. 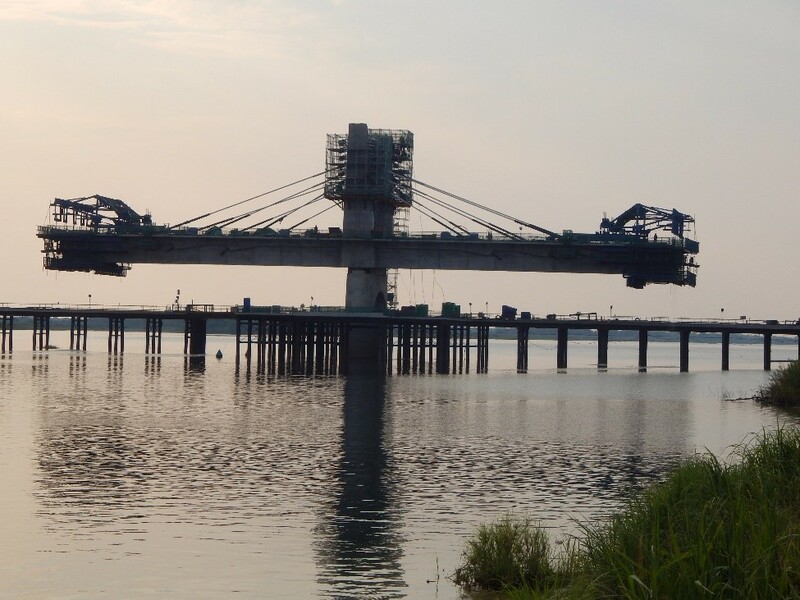 The good news is that the Bridge over the Zambezi is well on its way towards completion and it will be a pleasure to drive across, at a fee of course. This was a fantastic trip into Africa to a few really special places with sightings that will be remembered for years to come. We had a special group of friends who took it all in their stride, and at times when the going got tough they just got on with it. A trip of this nature is not always easy and straight forward, travelling in Africa can have a curved ball coming your way at any time. This is what makes the trip so special.